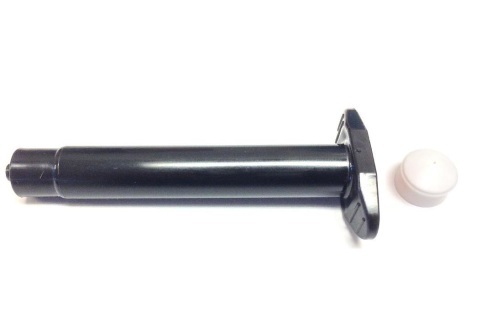 Pure, industry compliant, silicone and chloride free, low friction polypropylene with the Luer Lock Tip. 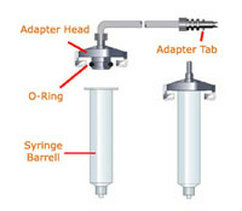 Specify IntelliSpense syringes for most materials and for use with most dispensers. This is the classic design for timed air dispensers, our dimensions haven't changed since IDS began! 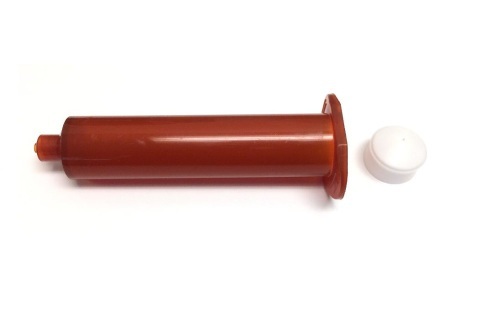 Many formulations can be purchased already packaged in a pneumatic syringe. A professional packager will remove all of the air bubbles for you. Contact your formulator for more information. Not sure if you should use Black or Amber? You should contact your formulator to make sure, or use Black if you are unable to confirm the material requirements. 1 cc = 1 ml, 1 teaspoonful is equivalent to 5 ml (or 5cc). 1 oz. = 30 ml (or 30cc). 2 oz. = to 60 ml (or 60cc). 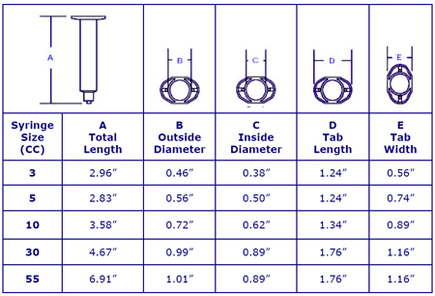 For larger volumes, try our Cartridges and Plungers. They range up to 20 ounce, and can also be fitted with a Luer Lock adapter to provide the same type of outlet you find on a syringe. IntelliSpense Pneumatic Syringes are built with the classic design for pressurized syringes. Silicone and chloride free. For use with pneumatic dispensers and IDS Syringe Guns). * Syringes are molded from polypropylene. Black syringes are intended for UV materials. This pack includes 25 each of the BLACK 55CC pneumatic syringe barrels and pistons. Contact IDS directly for bulk orders. IntelliSpense Pneumatic Syringes are built with the classic design for pressurized syringes. Silicone and chloride free. For use with pneumatic dispensers and IDS Syringe Guns). * Syringes are molded from polypropylene. Black syringes are intended for use with UV materials. This pack includes 50 each of the BLACK 30CC pneumatic syringe barrels and pistons. Contact IDS directly for bulk orders. 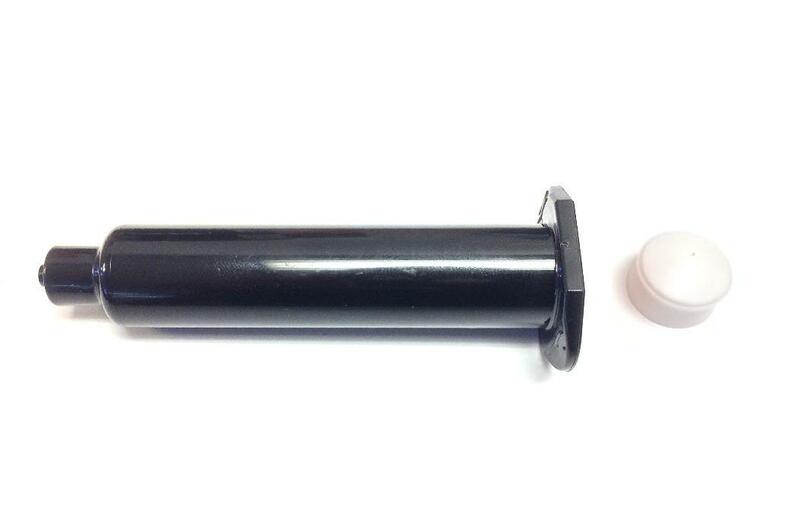 This pack includes 50 each of the BLACK 10CC pneumatic syringe barrels and pistons. Contact IDS directly for bulk orders. IntelliSpense Pneumatic Syringes are built with the classic design for pressurized syringes. Silicone and chloride free. For use with pneumatic dispensers. Syringes are molded from polypropylene. Black syringes are intended for use with UV materials. This pack includes 50 each of the BLACK 5CC pneumatic syringe barrels and pistons. Contact IDS directly for bulk orders. IntelliSpense Pneumatic Syringes are built with the classic design for pressurized syringes. Silicone and chloride free. For use with pneumatic dispensers. Syringes are molded from polypropylene. Black syringes are intended for use with UV curable materials. This pack includes 50 each of the BLACK 3CC pneumatic syringe barrels and pistons. Contact IDS directly for bulk orders. IntelliSpense Pneumatic Syringes are built with the classic design for pressurized syringes. Silicone and chloride free. For use with pneumatic dispensers and IDS Syringe Guns). * Syringes are molded from polypropylene. Amber syringes are intended for some UV materials. Contact your formulator to make sure you do not need to use the black syringe. This pack includes 25 each of the AMBER 55CC pneumatic syringe barrels and pistons. Contact IDS directly for bulk orders. This pack includes 50 each of the AMBER 30CC pneumatic syringe barrels and pistons. Contact IDS directly for bulk orders. This pack includes 50 each of the AMBER 10CC pneumatic syringe barrels and pistons. Contact IDS directly for bulk orders. IntelliSpense Pneumatic Syringes are built with the classic design for pressurized syringes. Silicone and chloride free. For use with pneumatic dispensers. Syringes are molded from polypropylene. Amber syringes are intended for some UV materials. Contact your formulator to make sure you do not need to use the black syringe. This pack includes 50 each of the AMBER 5CC pneumatic syringe barrels and pistons. Contact IDS directly for bulk orders. This pack includes 50 each of the AMBER 3CC pneumatic syringe barrels and pistons. Contact IDS directly for bulk orders. For Bulk Boxes Add a "B"
to your part number. Contact an IDS representative for a quote with the build time and costs. to your part number. Contact an IDS representative for a quote with the build time and costs. The items below DO NOT INCLUDE THE PISTON.